Middle Eastern souks are known for their old-city charms and charismatic streets filled with commotion. 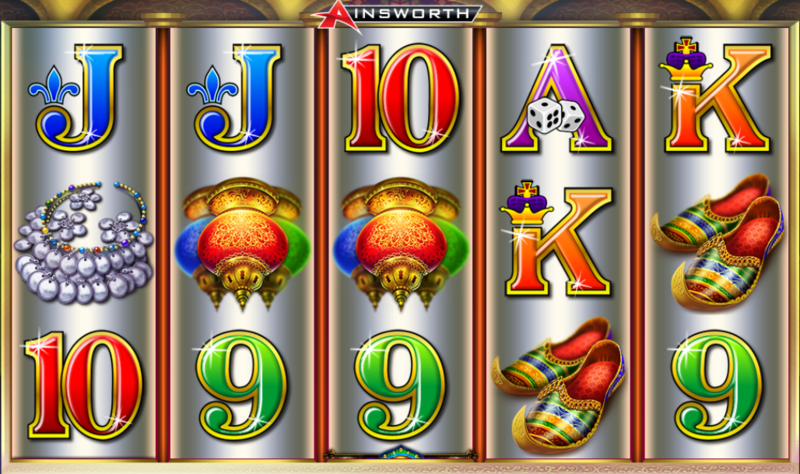 Taking inspiration from such markets, Ainsworth has created a video slot game named Grand Bazaar. Grand Bazaar is literally a market place for you to enjoy and grab you goodies from. The Arabian Nights theme from Aladdin seems to have been the real motive behind the game. The backdrop of this game is very alluring. This is one of the things that grip you when you enter the slot. Grand Bazaar has several quirky gameplay and bonuses for you to unravel. Features like wilds, scattered wilds, multipliers, and free spins await you. The mysterious souk allows 1 as a minimum coin value for every line. The coin size per line is also a minimum of 0.01 up to a maximum of 0.75. It has a jackpot size of 2x times the wager. Every player can wager a min amount of £1 which will go up to £75 per spin. These are the technical basics of this game. Knowledge of these will help you start the game. Now coming to the RTP of this game, the rate stands at 93.94%. Now, this may come as a shocker because all the other elements of this game are decent. However, the RTP really suffers and acts as a downside of this game. This mystical creation by Ainsworth takes its inspiration from the souks of Middle Eastern countries. The game features a classic set up of 5 reels along with 3 rows. You will find its pay lines to be at a maximum of 100 which is also a classic symbol of Ainsworth games. The symbols and backdrop of this game emulate a scene from a spice market in an Arabic country. Its symbols include number 9, 10 and card values of A, Q, K, and J. These are the basic symbols which a moderate paying level. Other high paying symbols include items like a handful of gems, stringed instruments, gem enshrined teapots, chandelier, slippers ornaments etc. Their value will be clearer to you in the following section. Additional information of value is that Grand Bazaar will be compatible with all the operating software and every electronic device. 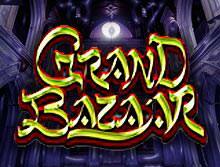 Logo: The logo of Grand Bazaar has special significance when it comes to bonuses. By making use of this logo you can attain any winning combo. Grand Bazaar encloses every symbol there is in the game except the symbol of Handful of gems. The logo of Grand Bazaar can be spotted on reels 3/4/5 and only on reel 5 in the base round. This symbol acts as a wild. When it appears it acts as stacked and has the capacity to fill the entire reel. It acts as a substitute for every symbol except the scatter symbol. A Handful of Gems: This is a very important symbol in this game. To be able to excel at the bonus rounds, you need this symbol. If you land this symbol in a pair of 3 or more, then you will be able to trigger 8 free spins. If this icon appears only in a singular number or in a pair then you will land 1 free spin for every consecutive symbol. This symbol is a scatter symbol and can even give you a payout which will either be 5x times more than your wager or 100x times more or anything in between. Ornate Lamps: This symbol is fairly special as, if you land these in the reel then you will receive a prize which is 2000 times more than you wager or bet amount. This feature is worth looking into because it doesn’t require much to trigger but gives a really big chunk of a prize to its players. Another tip is that be on the lookout for is the grand bazaar icon. See if it happens to appear on the 3rd reel. Because this will enable you to have a multiplier of up to 3x times your wager. This can appear at random on all the rest of your free spins. Grand Bazaar has excelled in giving bonuses and multipliers. As players, you will get plenty of occasions to get a chunky payout. The feature isn’t a cakewalk and may take a while to trigger. But when it does, you will luck out. Apart from that, the downsides are the low RTP and the high variance. You will have to be more careful while playing the game as to not get carried away. If you have the wit and patience to pull this game off then you may just hit the jackpot.